DCI Ambassadors: Taking it to the streets! 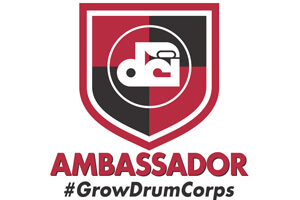 Drum Corps International is ready to launch the 2013 edition of its Ambassador program, a grassroots effort that engages high school and college students across the country to help promote the DCI Summer Tour and other events and activities. With nearly 2,500 students taking part in the program in 2012, Ambassadors were charged with reaching out to their fellow students, educators, band parents and others to share excitement for and information about DCI Tour events in their area. DCI Director of Business Development John DeNovi says that the group certainly lived up to its motto to "#GrowDrumCorps." "We were very pleased with the results of the first year of the Ambassador program," DeNovi said. "Group ticket sales along with attendance at the World Championships and many other events were up in 2012, thanks in large part to the dedicated work of our network of Ambassadors across the country." DCI is currently recruiting students to take part in the Ambassador program for 2013. "Along with high school and college students, we're also looking for current corps members to step in to help spread the word about the 2013 Tour," DeNovi said. "Though many will leave for the summer at the end of May, these are the members who will be out on the field performing. Enlisting their assistance to get their friends and classmates excited about coming out to see and support them at an event this summer is really important." The Ambassador program is free to join, and those interested can register online to be a part of it. At the end of March, DCI will mail Ambassadors an exclusive packet of supplies and information including posters, flyers, decals and more. Several of these items can be customized to a specific DCI Tour event or series of events near the Ambassador's hometown. Posters and flyers can also be downloaded online for printing at home or school. 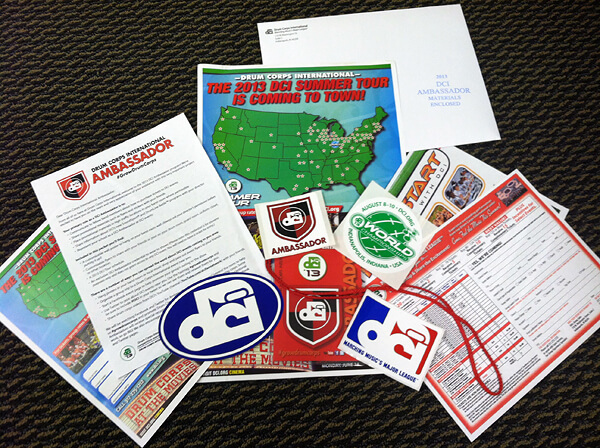 promotional materials to spread the word about the 2013 DCI Tour. Membership in the Ambassadors is currently limited to those within in the United States, but DeNovi says that DCI is working to roll out an international version of the program in the near future. "With DCI's new programs like DrumLine Battle and SoundSport, along with ongoing developments to bring our annual movie theater events to markets outside of the U.S., the international reach of Drum Corps International continues to grow. We can't wait to enroll Ambassadors in Canada, Asia, Europe and other areas around the world."